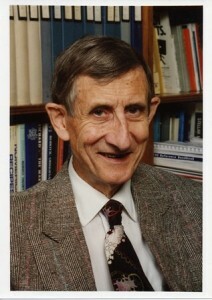 Freeman J. Dyson was born in 1923 in Crowthorne, England. He received a BA in mathematics from the University of Cambridge in 1945, and came to the United States in 1947 as a Commonwealth Fellow at Cornell University. He settled in the USA permanently in 1951, became a professor of physics at the Institute for Advanced Study at Princeton in 1953, and retired as Professor Emeritus in 1994. Professor Dyson began his career as a mathematician but then turned to the exciting new developments in physics in the 1940s, particularly the theory of quantized fields. He wrote two papers on the foundations of quantum electrodynamics that have had a lasting influence on many branches of modern physics. He went on to work in condensed-matter physics, statistical mechanics, nuclear engineering, climate studies, astrophysics, and biology. Beyond his professional work in physics, Freeman Dyson has a keen awareness of the human side of science and of the human consequences of technology. His books for the general public include Disturbing the Universe, Weapons and Hope, Infinite in All Direction, and A Many-colored Glass. In 2000 he was awarded the Templeton Prize for Progress in Religion.